Indulging is a part of life. While I don’t exactly want to see clients put on 5 pounds over Thanksgiving weekend, I remind them that if they lead a healthy and fit lifestyle, they can afford to indulge and/or take a break from the gym…just as long as they hop back on the wagon. 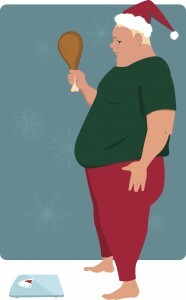 Studies have shown that people can gain 5 or more pounds over the holiday season. There are company/family parties, meet up’s with friends, and cookies tossed in your view left and right. It is up to you to stay strong and not go overboard. Only YOU can make that happen. Some ways to avoid those extra calories include choosing only a couple of parties to attend, not showing up to a get-together starving, drinking water instead of alcohol, bringing a healthy side dish to share (at least you can nibble on this if nothing else is good for you!) and of course, sticking to your workout regimen. Enjoy this holiday season. Remember, it’s the most magical time of year! Well, unless you are like me and think summer is the most magical time of year. I am already looking forward to flip flops and afternoons by the pool! Cheers!